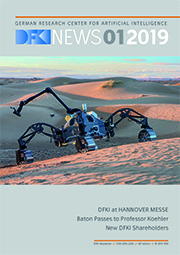 In order to give a broad range of interested parties access to important AI topics, the DFKI participates in so-called MOOCs (Massive Open Online Courses). A MOOC is an online course that primarily serves higher education and adult education and is generally available to everyone on the Internet without access or admission restrictions. In March 2017, at the beginning of CEBIT 2017, the joint MOOC of DFKI and Acatech on the current topic of machine learning was launched, for which a large number of participants have registered and in which DFKI lecturers play a prominent role. Prof. Wahlster from DFKI and Henning Kagermann from Acatech will guide you through the online course. More detailed information about MOOC Machine Learning can be found here. In order to familiarize a large number of interested parties with the functions, prerequisites and possibilities of data- and platform-based services, acatech, Accenture and the German Federal Ministry of Economics and Energy (BMWi) have jointly realized a Massive Open Online Course on the topic of “Smart Service World – Data- and Platform-based business models”. Prof. Dr. Wolfgang Wahlster and Prof. Dr. Anthony Jameson from DFKI contributed four lectures from the field of Artificial Intelligence to the course which lasted about 10 hours. The course started in April 2018 and all important course information can be found here.